A miracle is a violation of the laws of nature; and as a firm and unalterable experience has established these laws, the proof against a miracle, from the very nature of the fact, is as entire as any argument from experience can possibly be imagined. Why is it more than probable, that all men must die; that lead cannot, of itself, remain suspended in the air; that fire consumes wood, and is extinguished by water; unless it be, that these events are found agreeable to the laws of nature, and there is required a violation of these laws, or in other words, a miracle to prevent them? Nothing is esteemed a miracle, if it ever happen in the common course of nature. It is no miracle that a man, seemingly in good health, should die on a sudden: because such a kind of death, though more unusual than any other, has yet been frequently observed to happen. But it is a miracle, that a dead man should come to life; because that has never been observed in any age or country. There must, therefore, be a uniform experience against every miraculous event, otherwise the event would not merit that appellation. And as a uniform experience amounts to a proof, there is here a direct and full proof, from the nature of the fact, against the existence of any miracle; nor can such a proof be destroyed, or the miracle rendered credible, but by an opposite proof, which is superior. The plain consequence is (and it is a general maxim worthy of our attention), ‘that no testimony is sufficient to establish a miracle, unless the testimony be of such a kind, that its falsehood would be more miraculous, than the fact, which it endeavors to establish; and even in that case there is a mutual destruction of arguments, and the superior only gives us an assurance suitable to that degree of force, which remains, after deducting the inferior. There is a better definition of miracle, which is simply something extraordinary and marvelous that is not explicable by natural or scientific explanations. Once we use that better definition, it's a great blow to Hume's reasoning. Another problem with Hume's reasoning is the naivete involved in its consideration of laws of nature. Nature always behaves in fixed or predictable ways, without throwing us much in the way of surprises. Humans can figure out from their experience what these fixed tendencies are. Once humans have figured out these tendencies, they are then entitled to exclude any report of experiences that differ from these tendencies that have been observed in the past. There are all kinds of reasons why such assumptions are invalid. For one thing, very often nature often throws us surprises, such as earthquakes, volcanic eruptions, meteors, and many types of anomalous phenomena. Secondly, humans are generally not smart enough or knowledgeable enough or experienced enough to be declaring that some particular tendency is an inviolable law of nature, based on our small experience which occurred in only the tiniest “zillionth” sliver of the universe's history, and occurred while living on only a “zillionth” iota of the universe's territory. Third, from the mere fact that we always have seen X happening, we are not entitled to conclude that X must always happen (unless we have solid knowledge of reasons why X must always happen). And from the fact that we have never previously seen X, we are not entitled to conclude that we cannot now start observing X. 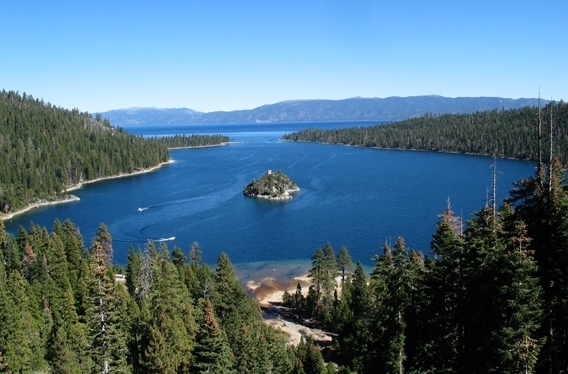 For example, if you were an American colonist of Hume's time (around 1770), you might have deduced that it was a law of nature that big earthquakes don't occur anywhere near the American colonies, based on the “firm and unalterable experience” that no such earthquakes had been observed. But such a law would have been invalid, and very large earthquakes did occur in Missouri in 1811 (the New Madrid earthquakes). Similarly if you were a Roman living in Pompeii in 78 AD, you might have assumed it was a law of nature that “mountain tops never explode,” but you would have been soon surprised when just such a thing happened in the eruption that buried Pompeii. No, a uniform experience does not amount to a proof. Even if humans have always experienced X, this does not prove that something different from X may some day occur. And even if humans have never experienced X, it is no proof that they will not in the future experience X. What Hume seems to suggest is a kind of reasoning which we might visualize by imagining a scale. On the left side is human experience suggesting that X does not happen. On the right side is some human experience suggesting that X did happen. Unless the right side outweighs the left side, according to Hume, we should not believe that X happens. But this makes no sense. If people in 100 cities are not blown up by asteroids, and they all conclude that “asteroids don't blow up cities,” we do not need 101 cities to be blown up by asteroids to show that an asteroid can blow up a city. A case of a single city being blown up by an asteroid is sufficient to show such a thing. Before September 11, 2001, it was generally believed that fires can't cause skyscrapers to fall, based on 1000 skyscraper fires. But we didn't need 1001 skyscrapers falling during fires to show that such a thing can happen; we only needed one of them like the two that fell on September 11, 2001. What's ironic is that in many other places in his writings, Hume was very skeptical about human knowledge and human abilities. He often tended to think of human beings as error-prone stumblers and bumblers, and he famously claimed that reason is the slave of the passions. But when it came to considering man's ability to proclaim all-encompassing laws of nature from man's limited experience, Hume “checked at the door” his usual skepticism, and spoke in a very naive way as if such laws could be proclaimed with complete confidence. It's the same deal for many modern skeptics: they bring out unbounded skepticism for people reporting the anomalous, but zero skepticism towards those who are dogmatically declaring that such things can't happen. This is often used as some justification for denying evidence of the paranormal. But the problem is that claims of the paranormal usually don't rest on a single person's testimony. The better claims of the paranormal are supported either by the testimony of many witnesses, or large amounts of photographic evidence or laboratory evidence. A photo I took yesterday, described here. In some cases there are two of these three things to support the claim. For example, evidence for ESP includes testimony by countless observers and also lots of good laboratory evidence; and evidence for UFO's includes a wealth of witness testimony and photographic testimony. It's therefore fallacious to speak as it's all a question of whether we should believe one person's word. Ironically, the very thing that Hume used as an example of testimony that can't possibly be true has actually been proven true. See here for quite a few cases of people who revived from death quite a while after they had been declared dead, with no vital signs. This is another example of why it's wrong to assume that some thing can't happen merely because it wasn't previously observed. I read Bill Nye's book Undeniable: Evolution and the Science of Creation to give a well-known author a chance to change my opinion that there is no compelling evidence for the claim that the blind process of natural selection can explain the astounding wonders of biological complexity (for the kind of reasons I discuss here). Looking at the book's index, I found that only 8 pages in the 298-page book discuss natural selection. I didn't find this surprising, because while there is lots of evidence that evolution (or a succession of life forms mimicking evolution) has occurred, the evidence that natural selection is the main explanation for this progression is actually very weak. Natural selection is a real biological effect, which can explain a few things, such as a change in a population of organisms in which a trait held by the minority becomes a trait held by the majority. But natural selection is not very good at explaining the origin of new forms of biological complexity, contrary to what is often claimed. Looking at the index's first reference to natural selection, I found immediately a very misleading statement by Nye. He states, “Evolution is also not random; it's the opposite of random” (a misstatement he repeats later). No, orthodox Darwinian evolution is, in fact, quite random. When I do a Google search for “definition of random,” the first definition that comes up is: “made, done, happening, or chosen without method or conscious decision.” The synonyms that are listed include “unplanned” and “undirected.” Evolution as described by Darwinian orthodoxy is therefore quite random, as very many evolution enthusiasts have themselves told us over the years. The first four pages in which Nye discusses natural selection do not give anything like a coherent argument that natural selection can explain biological complexity. In fact, Nye seems to repeatedly veer into attempts to explain natural selection by discussing marketplace and corporate behavior. This is misguided, because corporate and market behavior (such as the “survival of the fittest” of well-designed products) are examples of what is known as artificial selection , which involves conscious decision making and is entirely different from unconscious natural selection. You can in no way validate the power of natural selection by giving examples of artificial selection. The main problem with believing that natural selection is the main explanation for biological complexity is that the biological world has a thousand marvels of immense coordination, in which components are arranged in extremely coordinated and complex groups of components; but neither natural selection nor random mutations offer any mechanism for coordination. Random mutations can explain why different small components might occasionally arise, but orthodox Darwinism offers no mechanism by which these components would arrange themselves into highly coordinated and complex groups of components. For the orthodox Darwinists there are countless problems of this type: how did nature “climb the staircase” to reach some top level of complex coordination, in such a way so that each step added to the reproductive value or survival value of an organism, so that each step was useful? Under Darwinian assumptions, each step must be useful, or we can't explain it. One such “climbing the staircase” problem involves the evolution of wings. To the naive mind, it does not appear that a small part of a wing would have any use. Nye tackles this problem, but fails to explain it away. For one thing, his approach involves a kind of cheat. His chapter on the topic is entitled “What Good Is Half a Wing?” Trying to explain just that is cheating, because it is starting halfway up the stairway, when you should be starting at the bottom of the stairway. The question that should be asked is not “what good is half a wing” but “what good is an eighth of a wing” or “what good is a wing stump.” To explain this problem under orthodox Darwinian assumptions, one would need to offer a scenario by which a species might progress through this series: (1) no wing; (2) an eighth of a wing; (3) two eighths of wing; (4) three eighths of a wing; (5) four eighths of a wing; and so forth. One would need to explain how each of these progressions involved an increase in either reproductive value or survival value. Nye is unable to explain such a thing. He offers two ideas to try to help explain the evolution of wings. The first is that organisms began to develop wings to keep them warm. This doesn't work, because that can't explain the first two steps in the stairway; it can't explain why a species would start to evolve a wing stump or just an eighth of a wing. A wing stump or an eighth of a wing is worthless for keeping you warm. If you doubt this, I suggest the following experiment. Break a chopstick in half, and paste a few feathers on it. Then tape that feathered half chopstick on your shoulders, and go out on a cold night. You will not feel any warmer. The second idea Nye offers to try to explain the evolution of wings is to suggest that partial wings were useful for gliding. This does not work, for two reasons. A lesser reason is that gliding is only useful for certain types of animals (such as tree-dwellers); but it is believed that birds evolved from reptiles that did not live in trees. The larger reason is that to get even a capability for gliding, a wing must be quite well developed, much more than just a wing stump. So a gliding hypothesis cannot explain why an organism would evolve the first eighth of a wing or a wing stump. For the orthodox Darwinian, there are countless problems like this wing stump problem – problems of explaining how blind evolution could have reached some improbable target involving a great complex coordination of components. If you shrink the scale, things get much, much worse. The problem of explaining the mechanisms of cellular machinery are vastly more difficult. For example, the basic cellular operation of protein synthesis involves at least six different very complicated components which must all be tightly coordinated: a genetic code, DNA, messenger RNA, ribosomal RNA, transfer RNA, and proteins. The degree of coordination at this microscopic level makes the coordination of muscles and bones in a wing look very trivial in comparison. How can all this coordination be explained when Darwinian orthodoxy offers no mechanism for coordination? Nye offers no hint, and I do not find “coordination” in the ten-page index at the back of his book. I see in his index only two pages that discuss biological complexity (pages 60-61), and those pages offer nothing to explain it (other than the not very helpful claim that the “speed of sexual selection” may contribute to biological complexity). I also see no mention of “coordination” in the index of Ridley's 600-page textbook on evolution. But I guess that's not surprising, since explaining biological coordination is not something that Darwinian orthodoxy does in any substantive way. A better book on evolution is Nick Lane's book Life Ascending: The Ten Great Inventions of Evolution. Lane talks about ten leaps that life had to make to get to where it is now, but he sure doesn't persuade a probing reader that natural selection was all that was involved. One of the great leaps he talks about is the leap of prokaryotic cells to eukaryotic cells. Prokaryotic cells are primitive cells, and eukaryotic cells are the vastly more complicated, feature-rich cells which we are made up of. The move from one type to another has been described as like moving from a one-room studio apartment to a millionaire's mansion. We could also explain it as like upgrading from a 1980's version of MS-DOS to the current version of Windows (Windows 10). Here is how Lane attempts to describe this change, using not natural selection as the explanation but the weird theory of endosymbiosis. The world is split in two. There are the eternal prokaryotes and the kaleidoscopic eukaryotes. The transition from one to the other seems not to have been a gradual evolution, no slow climb to complexity...Only a rare and fortuitous event, a collaboration between two prokaryotes, one somehow getting inside the other, broke the deadlock. An accident. The new chimeric cell faced a host of problems...A happenstance solution may have given rise not just to the cell nucleus but also to a tendency to collect DNA and to combine it it in the endless constellations of the magical world around us. Another accident. The world of marvels around us, it seems, springs from two deep accidents. On such tender threads hangs fate. We are lucky to be here at all. This is the weird theory that seems to be that a very complicated cell arose after one simple cell ate another simple cell and they somehow magically became a nice coordinated cell that was vastly more complicated. It's extremely hard to believe that this would happen by chance. “A quantum leap in complexity by digesting something” is not a plausible theory, particularly since eukaryotic cells are a hundred times larger in diameter than typical prokaryotic cells such as bacteria. That such a theory must be resorted to is further evidence that natural selection is not up to the job of explaining the origin of biological complexity. The appearance of the first self-replicating molecules. The appearance of the first primitive cells, and the genetic code they required (a system of symbolic representations). 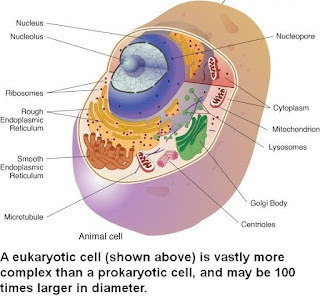 The appearance of eukaryotic cells vastly more complex than prokaryotic cells – a quantum leap which Lane suggests cannot be explained by a gradual progression. The transition of life from the sea to the land (hard to explain under current thinking, rather like explaining an evolution from earth-based organisms to organisms that live in a vacuum of outer space). The appearance of birds, which has the wing stump problem. The appearance of the human mind (with lots of features that natural selection doesn't explain, because they don't have survival value, as explained here). Overall, the ability of natural selection and mutations to explain these things is poor. If scientists think otherwise, it's partly because they have long had a habit of underestimating requirements, as Lane does rather laughably when he makes this reductionist claim about the famous “hard problem of consciousness” emphasized by philosopher David Chalmers: “Surely Chalmers' hard problem is actually a problem in biochemistry.” As if some chemical equation could explain how Mind arises from matter. But the very clannish and dogmatic community of evolutionary biologists will probably continue for quite a while to push the Official Party Line that natural selection explains the origin of biological complexity, in a way rather similar to the way that Marxist dogmas (an Official Party Line) would be handed down authoritatively from Moscow in the years of the Soviet Union. Postscript: See this link for a list of about 50 researchers who are described as "a list of researchers and authors who have one way or another expressed their concerns on natural selection’s scope and believes that other mechanisms would better explain evolution processes." It's a very distinguished group (mostly scientists and professors), and each of them has written a book describing their views. Should the First Martian Astronauts Be “Anomaly Argonauts”? The United States spent 24 billion dollars (the equivalent of 180 billion in today's dollars) on several trips to the moon to perform the very boring job of collecting rocks. Why was so much money spent on such a boring task? 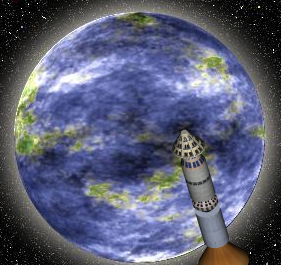 History books say that national prestige was one of the main reasons for the Apollo project. But there's another reason that is rather harder to explain. The Apollo project was funded largely because during its prime funding years people were still in the grips of an enthusiastic “space fever” that gripped the country in the late 1950's and the early 1960's. To understand this space fever, we should imagine ourselves in the boring white-bread world of the late 1950's. 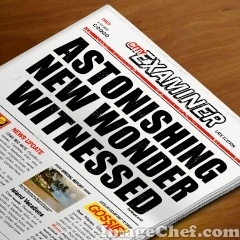 In those years magazines and Sunday newspaper supplements started to proclaim the coming of an exciting new Space Age. To a public which had never seen a space flight, this seemed like almost the most exciting thing imaginable. When the Mercury program started putting astronauts into space, in very dangerous manned missions, it was for quite some time “the greatest show on Earth.” Each time a Mercury astronaut got on the launchpad, TV viewers really had no idea whether the whole thing was going to blow up in a fiery explosion. In about the middle of this “space fever,” the Apollo program was announced. People were still in the grip of a great enthusiasm for space travel, and were willing to fund the program to the hilt. But by the time of the second moon landing, space fever started to wear off. People got quickly tired of the Apollo missions, and started asking: why are we spending such astronomical funds on missions that do little but gather rocks? Travel to another planet? Been there, done that. Well, not really, but it sure feels that way, once CGI has treated you to a hundred different versions of astronauts on another planet, all in vivid detail. So how can NASA generate the type of interest and enthusiasm that might be needed to fund a manned Mars mission? They won't be able to do it by highlighting the opportunities for rock collection on Mars. People have figured out from the Apollo missions that rock collection is as dull as dishwater. But there's a way in which NASA might be able to brew up some serious interest for a manned Mars mission: leverage the paranormal. I showed a closeup of this “mouse” to my wife and one of my daughters, without telling them it was from Mars, and asked: “What does this look like?” They both instantly answered: a mouse. Then there's the recently discovered anomaly discussed here, which looks like some ancient Assyrian face. NASA's approach to these anomalies has been very standoffish. But what if these anomalies (and similar anomalies that may be discovered in future years) were to be made the centerpiece of a new Mars mission? That just might generate the kind of enthusiasm needed to fund a new mission. It's time to wake up and smell the coffee. How many Martian domes and Martian “traffic lights” and Martian mouses and Martian sculptures and ridiculously long “levitating” Martian spoons can we photograph before it is obvious that some type of higher power is at work here, or was at work? We don't know what that higher power is, or whether it still exists; and we don't know whether it was extraterrestrial, spiritual, extra-dimensional or supernatural. But we want to send our guys to go investigate these incredibly strange things our rovers have photographed, and hopefully bring some of them back and put them in a museum for the whole world to look at. While doing this, we just might discover the secret of the universe. 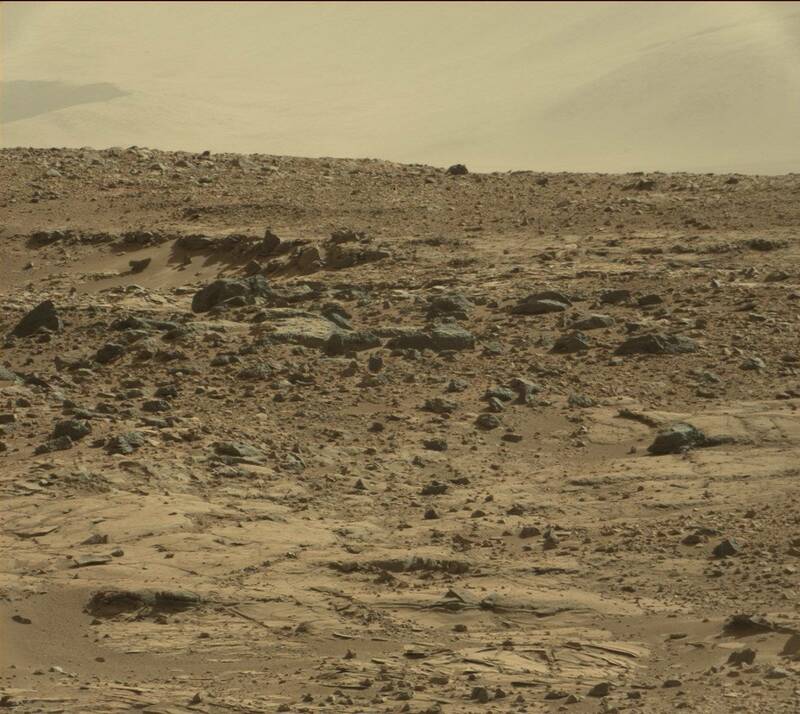 Please give us 500 billion dollars to send people to Mars, because rocks and boulders are incredibly interesting. Why on Mars there are some fascinating sedimentary striations, and all kinds of very interesting metamorphic mineral concentrations. We can imagine a Mars mission specifically centered around investigating anomalies. It would require some rover vehicle that would be capable of driving many miles so that astronauts could investigate many different previously photographed anomalies. But this would probably be feasible. Most of the Mars anomalies are concentrated in particular areas of Mars that were traversed by the Opportunity and Curiosity rovers. The anomalies are not randomly scattered across the planet. The issue of making anomaly investigations a central part of a future Mars mission is relevant to an important upcoming decision: the decision about where the next Mars rover should land. To keep in play the possibility of a manned mission centered around anomaly investigation, the next rover should land not all that far from either the Curiosity landing site or the Opportunity rover landing site. In that case you would (after about the year 2025) have two thirds of the discovered anomalies in a relatively small area of Mars that could be conveniently checked out by a landing team equipped with a rover vehicle. Long, long ago they told the tale of how brave voyagers risked great dangers to travel far away, so that they could bring back a strange eerie object more wondrous than any a man had ever seen. Now our brave astronauts will embark on a similar voyage, hoping to bring back not just one such object, but several of them. I could imagine how such an approach might generate more interest than one in which astronauts are depicted mainly as just rock collectors. The average person may occasionally read about the paranormal, and may get the impression that it is some extremely rare thing, based on how infrequently it is reported. But there are reasons for thinking that what you read about the paranormal may be just the tip of the tip of the iceberg. Instead of being a “blue moon” type of thing, the paranormal may be extremely common. Various factors may have caused you to think of the paranormal as being something extremely uncommon, when it actually may be very common. Let's look at what some of these factors may be. One factor is that probably the overwhelming majority of people who have paranormal experiences do not publicly report them. There are several reasons why someone having a paranormal experience may not report it publicly. He may fear being ridiculed, or he may fear that if he reports a paranormal experience he may be thought of as weird or flaky or a liar, and that this may hurt his job prospects. Or someone may not report a paranormal experience simply because there was not any physical evidence he can present to show the incident occurred. Of the people who do publicly report their paranormal experiences, probably the great majority simply make some social media entry that you are very unlikely to ever hear about. My guess is that 99% of all paranormal experiences are not reported in a way that would be likely to end up in a news story that you might ever read. Corporations are masters of milking the media for news coverage, but what is the chance that some person having a paranormal experience will then spam the news media (or issue a press release) in the right way to get good news coverage? Almost zero. Another reason why the paranormal may be vastly more common than you might imagine is that your college or university probably failed to teach you anything about it. Modern colleges and universities are bastions of materialist thinking that like to exclude and denigrate the paranormal. When you took that psychology course in college, you should have learned all about the years of very substantial and methodical research done on the paranormal, particularly ESP. But you probably learned very little or nothing on the topic, leaving you with the impression that there isn't much there. But what about news media such as newspapers, magazines, and online news sources? In general, they publish little about the paranormal. Someone with a very newsworthy account of a paranormal experience has only a small chance of getting substantial coverage in such media. Below are some factors that tend to inhibit coverage about the paranormal. News sources may exclude coverage of a paranormal story on the ground that it is not “respectable” or lacks prestige, even if it is well backed up by observations. But the weird speculations of some PhD may get exactly such coverage, even if they have no such observations to back them up. This makes no sense, because speculations should be the humble handmaidens of observations and experiments, rather than being granted a higher status. A large fraction of paranormal experiences may be excluded on the grounds that they have some association with some religion. The thinking of a writer or editor may be that he doesn't want to discuss some paranormal experience associated with a religious person, on the grounds that this has low prestige, or that this may offend people of other religions or people with no religion. The problem with such an approach is that it ends up excluding a large fraction of all paranormal evidence. Once you've decided that you're not going to cover paranormal evidence associated with Catholics, fundamentalist Protestants, Hindus, Buddhists, Mormons, Shintoists, Spiritualists, and Muslims, you've then filtered out a large fraction (or perhaps a majority) of the evidence. If some paranormal news story does get covered by a news media, the story is likely to be “back buried” so that you probably won't read it, rather than “front-paged.”. Even if the story is very worthy of followup coverage, it probably won't get it. If things worked similarly for other types of stories, we might have got one back page story on the Lewinsky affair, with no followup stories. Reasons such as these may mean that you are unlikely to read about some important paranormal event that occurs. But what if you do happen to read a story about it? The chances are that after you read such a story you won't learn the most pertinent details, because of what we may call underreporting. Underreporting is described in this blog post. It's basically what happens when some news source excludes the most relevant and startling details of a story, the details that might make you say, “there's no way we can explain that.” An example would be if a witness exactly reported seeing a dazzlingly bright 50-meter disk in the sky, and such an experience is merely reported by a news media as a “a sighting of something unusual in the sky” or a “sighting of a disk-like object.” The sin of underreporting is habitually committed by wikipedia.com, which as a general rule has nothing but outrageously biased articles on paranormal topics, articles designed to make you think “there's nothing there.” The same sin of underreporting is committed by many other news sources. As a result of all of these factors, you may end up reading in your lifetime very little about the paranormal. You may get the impression that the paranormal is some “blue moon” type of thing, and that people who have paranormal experiences are some very rare oddballs such as Uri Geller. But to the contrary, there is good reason to think that paranormal experiences occur to large fractions of the public. Public opinion polls that deal with experiences with the paranormal (not just beliefs about the paranormal) show that significant fractions of the public say they have had paranormal experiences. For example, a Pew Research poll indicated that 29% of the American public claimed to have been in touch with someone who died, and 19% claim to have seen a ghost. My guess is that a more comprehensive poll asking about all types of paranormal experiences (including UFO's, ESP, mystical experiences, precognition, highly improbable answered prayers, and so forth) might suggest that more than half of the public have had some type of paranormal experiences at some time in their life. In fact, this infographic tells us that 71% of Americans report having had a paranormal experience. So despite the impression you get from our filtered print media, the paranormal may not be very abnormal. Requirements underestimation is what occurs when somebody underestimates what is required for something to happen, failing to understand the necessary prerequisites. Teenagers dreaming of their future may sometimes make such an error. A male teenager may think: all I need to be the next rock star is a guitar. But that ignores many other things you typically need: a good singing voice, good looks, guitar playing ability, connections, some catchy songs, and so forth. Similarly, a female teenager may think: all I need to be the next big starlet is a ticket to Hollywood. But that ignores lots of other typical requirements such as good looks, connections or a successful audition, and acting ability or comedic ability. It's not just teenagers who are guilty of requirements underestimation. Even the leader of a country may underestimate requirements. One example is this statement by Adolf Hitler while planning the conquest of the Soviet Union: You only have to kick in the door and the whole rotten structure will come crashing down. Judging from that statement, Hitler thought that all that was needed to conquer Russia was a swift, strong initial attack. This proved to be a huge mistake. The next winter countless German soldiers froze to death because they didn't have winter coats, one of the requirements that had been overlooked. One very different set of people that has underestimated requirements repeatedly over the centuries is theoretical scientists. Whether estimating the requirements for life or the requirements for an orderly universe or the requirements for the human mind or the requirements for a body such as the sun or the requirements for stable matter, our scientists have again and again underestimated the requirements, failing to understand how high the requirements are. 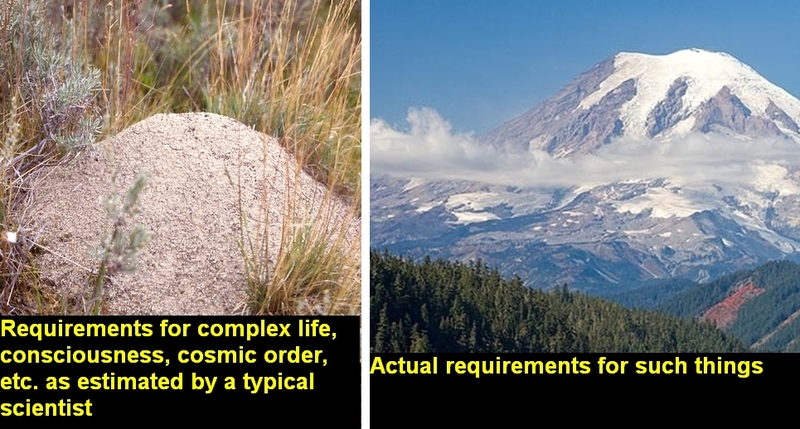 Many decades ago scientists thought that there were no particularly special requirements for the origin of life. It was believed that life could just spontaneously arise from sterile matter, and that this routinely happened. Even after this spontaneous generation idea died away, scientists continued to believe that the appearance of the first life didn't require anything too special. Darwin's description of the origin of life merely mentions some chemicals in a warm pond, nothing too special. But now we understand that the origin of life has vastly greater requirements, including the fantastically improbable appearance of self replicating molecules, the appearance of a genetic code, and so forth. Clearly the origin of life has vastly higher requirements than scientists imagined in the nineteenth century. In considering the idea of atoms, scientists long underestimated the requirements that must be met for atoms to exist, assuming that there basically were no such requirements. The idea was that atoms were just solid tiny balls, the type of things that would have no requirements. But the more scientists learned about atoms, the more they learned about how many requirements must be met for our atoms to exist. Among the many requirements now known are: an existence of a strong nuclear force that binds the nucleus together; an existence of electromagnetic attraction between protons and electrons, which tends to keep electrons near the nucleus; the existence of quantum mechanics laws that prevent such an attraction from causing electrons to fall into the nucleus. In considering the sun, scientists long thought of it as something with no special requirements. They thought of the sun as just some hot ball of fire, and probably thought of it as having no more requirements than having a large mass to slowly burn. But now we understand that many requirement must be met for stars like the sun to exist. Besides Einstein's most famous equation, there are physical constants that must be very precisely fine-tuned, or stars like the sun won't be able to exist. When considering the origin of cosmic structure, scientists long thought that only one thing was needed: gravitation of the type described by Newton. But then eventually they concluded that there are more requirements: things such as dark matter and dark energy. For centuries astronomers thought that the universe had nothing along the lines of origin requirements. Their assumption was simply that the universe had existed forever. But then the Big Bang was discovered, and within 15 years scientists found out that it wasn't just any old Big Bang but an exquisitely fine-tuned Big Bang in which the initial expansion rate matched the critical density to 50 decimal places. So scientists got busy trying to create a theory trying to explain this new very precise requirement for our existence. Do you see the general trend here? The historical trend is that again and again theoretical scientists have vastly underestimated the requirements for the existence of beings such as ourselves and a universe such as ours. One reason this may happen is that a theoretical scientist has a very strong temptation to do such a thing. The fewer requirements that are recognized as things that must be explained to explain some aspect of nature, the easier it is for a scientist to claim that he has some theory that explains that aspect of nature. If a scientist candidly acknowledges that the requirements for phenomenon X are mountainous requirements, he won't be able to claim he has a good theory explaining that phenomenon; but if he speaks as if those requirements are mere molehill requirements, he might be able to persuade you that he has a good theory explaining the phenomenon. They keep thinking "molehills" when they should be thinking "mountains"
This perennial sin of requirements underestimation continues to this day. A current example of requirements underestimation is Darwinism, the idea that evolution can be explained merely by natural selection and random mutations. This idea drastically underestimates the requirements for the origin of complex biological functionality, by ignoring the high degree of coordination that is needed for such a thing. Every engineer knows that tremendous coordination is required for the origin of complex functionality. Every software manager knows that you cannot do a complicated software release without a high degree of coordination in introducing the diverse parts that make up a new substantial unit of functionality. But Darwinism has no mechanism for any such coordination. It requires that we believe that required bits of functionality arrive at random times over vast time spans, and that this somehow works to create marvelously intricate and complex functionality. A high degree of sequential coordination, so that parts are appropriately preceded by other parts on which they are dependent. Darwinism has basically zero provision for the last three requirements. According to Darwinism, the requirements for the origin of fantastically complicated biological functionality we observe are simply the following: random genetic variation (helped by mutations) and survival of the fittest. This is a gigantic case of requirements underestimation, the same intellectual sin that our theoretical scientists have committed so often throughout scientific history. Our neurologists also underestimate requirements drastically in trying to explain human consciousness. They assume a simplistic “light from the light bulb” model of consciousness, in which our minds are merely the product of brain activity. But how can a few pounds of neurons produce all the wonders of human mentality? Why would merely arranging some cells in some particular way magically cause the wonder of human consciousness? Thinking more realistically, we will assume that a requirement of the human mind is some unknown X factor that we do not understand, something that comes from beyond our brains. Only by such an assumption can we account for the wealth of solid evidence for human paranormal abilities and unusual psychic experiences. Such evidence is overlooked and ignored by most neurologists, who underestimate the requirements for our minds by assuming that they are purely material. Have we pretty much figured out the physical requirements for a universe such as ours? There is every reason to suspect that we have barely begun such a task. One reason is that we have in no way accounted for the apparently vast information processing requirements for an orderly universe. For example, under current theory there is a force of gravitational attraction between your body and every other piece of matter in the universe, in addition to forces of electromagnetic repulsion and attraction between your body and every body in the universe. But how is such a thing calculated? It would seem all too reasonable to assume that the universe has behind it some vast information processing infrastructure which allows such things to be calculated. But the whole issue of the information processing requirements of nature has been almost completely ignored by scientists, who just kind of think that “nature somehow magically does it.” When we actually get into determining the information processing requirements of nature, we may well discover countless additional requirements for our existence. We may also discover that a universe such as ours absolutely requires not merely a few physical laws, but a complicated regulatory system resembling a very complex computer program, with an extensive amount of conditional logic embedded within it. What is astonishing is the failure of scientists to imagine that there may be a wealth of requirements for our existence that they know nothing about, even though the history of requirements underestimation by scientists strongly suggests exactly such a thing. It is as if after discovering the seventh requirement for beings such as us and a universe such as ours, scientists then decided that there were no more than seven such requirements; and that after discovering the twenty-first requirement for beings such as us and a universe such as ours, scientists then decided that there were no more than twenty-one such requirements; and that after discovering the sixty-fifth requirement for beings such as us and a universe such as ours, scientists then decided that there were no more than sixty-five such requirements. Why is it that scientists cannot see the trend line here? Why is that they cannot imagine that the total requirements we have thus far discovered for beings such as us and a universe such as ours may be only a tenth or a hundredth of the actual requirements? Perhaps it is because that theoretical scientists would then be forced to stop swaggering about and thinking of themselves as grand lords of explanation, and to realize that their understanding of nature is merely paltry and fragmentary. On 9:00 on August 17, 2135 Ed Newton began another day as an office worker. The hardest part of Ed's day seemed to be the beginning, when he had to walk up 35 stories to his office on the 35th floor. They didn't use elevators at Ed's building, because elevators used too much electricity. As part of the global agreement to reduce fossil fuel emissions, part of a late effort to try to reduce global warming, non-essential examples of energy use had been banned. The ban included air conditioning, elevators, and power lawn mowers. Ed's life as an office worker had some similarities to the life of an office worker in the early twenty-first century. One major difference was the clothing. Around the year 2015 men came to work in “business casual” long sleeve shirts and khakis, if they were fortunate enough to work at a company without rigid dress requirements. Otherwise they might have to wear ties and perhaps even suits. But at Ed's company people dressed much more casually. All of the workers wore bathing suits. No one at the company had mandated that workers must wear bathing suits. It simply became necessary to do so. The temperature inside the building was typically 115 degrees Fahrenheit, sometimes climbing to 120. With these temperatures you could no longer wear pants or shirts without a high risk of fainting. Many of the employees wore hats indoors, but they were very unusual types of hats, what they called water hats. When you wore these hats, you looked kind of like someone wearing a big bowl on top of your head. But the bowl of the water hat had lots of little holes in it. The idea is that you would fill your water hat with water, and then water would gradually drip down on to your body. This might be enough to keep you from fainting from the heat. But the water boys kept things from getting too bad. The water boys were summer interns whose sole work was to keep employees from fainting because of the heat. The water boys would walk the office floors, armed with plant mist sprayers. Whenever they saw signs that an employee was close to fainting – signs such as a little pool of sweat on the employee's desk – the water boys would start spraying their plant sprayers around that employee's body. The glass parts of the windows on Ed's skyscraper had long since been removed, so that air could get in. This created a fierce competition for cubicle spaces close to the window holes, which employees battled out with great seriousness. Back around the year 2015 you might want to get a cubicle near the window so that you could enjoy the view. But in Ed's building the employees knew that their lives might depend on getting a cubicle close to a window hole. It was no secret on Ed's floor that the five employees who had died from heat prostration while working at their cubicles had all worked in cubicles near the center of the floor, away from the window breezes. The bosses on Ed's floor knew how to exert power with an iron hand. To force obedience, they didn't need to threaten to fire people or lower their salaries. The bosses would merely threaten to relocate workers to cubicles at the center of the building, which didn't get any breezes. At 4:07 PM a summer thunderstorm started. Whenever this happened all the people on the floor would drop whatever they were doing, and move over to the open window holes, hoping to catch a little bit of coolness and mist from the falling rain. Some would reach their hands out the 7-foot tall window holes, trying to wet their hands. They would then rub their hot faces with the cool raindrops. Ed saw his boss Mr. Fields reach his arms way out the window hole to catch some falling raindrops. “Be careful, boss,” urged Ed. “I know what the hell I'm doing,” said Mr. Fields, who reached his arm out a little bit farther out the window hole. Then Ed heard a sickening shriek which started out loud and then gradually died away into silence. Ed heard no noise when the body of Mr. Fields struck the ground 35 floors below. But later Ed realized that there was a silver lining in this dark cloud. For he realized that he would get Mr. Field's cubicle space closer to one of the window holes. Does Some Spiritual Realm Overlap Our Physical Realm? Could it be that our known physical reality is very close to some other very different reality, one that we cannot see, but that occasionally interacts with our reality? Could it be that such a different reality is inhabited by minds or spirits far greater than ours? Such a concept may seem unreasonable, until we consider that such a situation would be quite similar to the situation that we know exists for aquatic organisms living in a bay. Let us consider the situation of an aquatic organism living in a bay. Such an organism has a familiar local reality that it might traverse – the bay that it lives in. Beyond that bay lies a much greater reality that such an organism might journey to, if it were really adventurous. For by traveling out into the ocean, such an organism could gain access to many other distant realities such as distant rivers and distant bays. We might say that the organism's bay is rather like a planet, that the ocean the bay connects to is rather like outer space, and that the distant bays and distant bodies of water that can be accessed are rather like extraterrestrial planets. But the description above does not mention one very important fact about this organism living in a bay: the fact that lying very close to it is some totally different type of reality that the organism is totally unfamiliar with. I refer to the reality of the solid land that surrounds the bay. On that land is a reality unlike any that the organism has ever experienced: a reality where there dwells beings more advanced than anything in the bay. We have reality figured out. All reality consists of water and creatures like us who live in the water. 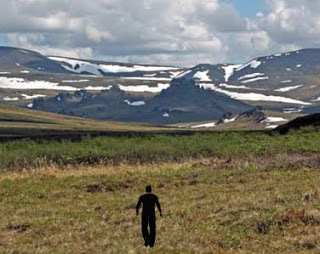 There exist distant, mysterious places we can visit. But such places are all like our reality – places where creatures live in the water. The great irony here would be that very close to such an octopus would be a totally different reality, the reality of land-based life. But the octopus would know nothing about such a reality, even though it is very close to him. We may be very much like such octopuses. The reason is that lying very close to our physical reality may be a totally different reality we cannot imagine: some spiritual realm. Such a realm may be inhabited by minds or spirits vastly more advanced than ours. We cannot imagine such a realm any more than an octopus can imagine life on the land. But we may end up in such a realm after we die. Below is a table that describes the similarities between these two scenarios. The second column represents a known reality. The third column represents a theoretical reality that has many similarities to the reality described in the second column. Some have speculated about some possible “other reality” lying outside of our known watery reality. Such talk is, of course, superstitious nonsense. All that exists is water and creatures like us who live in water. Some have speculated about some possible “other reality” lying outside our known material reality. Such talk is, of course, superstitious nonsense. All that exists is matter and creatures like us who live on a planet made of matter. Some day you may get a sign or calling card from such a spiritual Realm B. 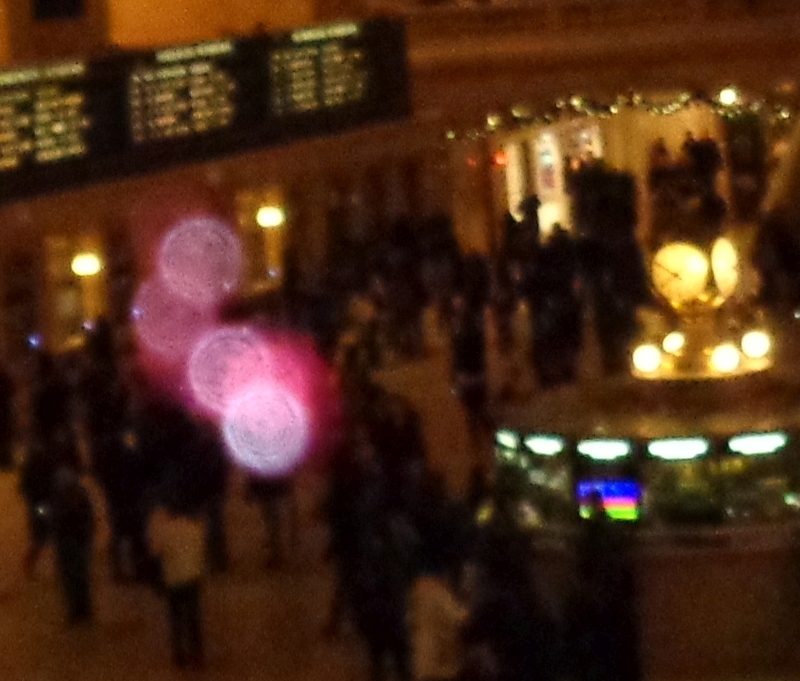 It might be a mysterious orb that shows up in your photo, an inexplicable voice or sound, a strange feeling of an unseen presence, or a series of coins that keep showing up inexplicably. Your first thought may be to exclude such a sign as something impossible, but perhaps you should be no more surprised by such a thing than some octopus at the bottom of a bay should be surprised to see a thrown pebble or a fishing line falling down into his watery realm. Note: This blog post was written in draft form a few days after the event described. On September 24th, 2014, I heard of my sister's death from cancer while I was walking to a park (I was informed by a telephone call). I continued my walk to the park and reached it within 30 minutes. When I entered the park, a very strange thing happened. Leaf after leaf started to fall from the trees. One could describe it as a leaf shower. In the sixty seconds it took me to walk from the entrance of the park to a pond, it seemed like at least 100 leaves fell (it could easily have been 150 or 200). Such an event would be less surprising if it were in October (when most of the leaves fall in New York City), or if it were a very windy day. But it was neither. The average wind speed in New York City at the time was 11 miles per hour, and the location was far away from any place where urban “wind funnel” effects arise. The date was only September 24th, when relatively few leaves fall in New York City (peak foliage in New York City isn't until about October 17th). There was no noticeable gust of wind, just a gentle breeze. I immediately sensed that this event was very, very improbable. The odds against such a spike in leaf falls (during a sixty second period) seemed astronomical. For comparison, when I returned to the park on September 28th, I looked around for three minutes at the same spot where this “leaf shower” had occurred, counting the leaves that fell – but saw only one leaf fall. But just how unlikely was this “leaf shower” I saw on the day of my sister's death? 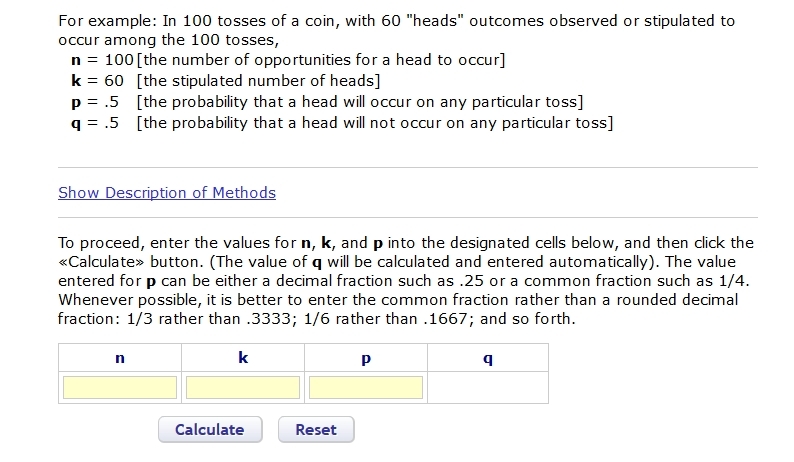 Calculating that turned out to be an interesting exercise in probability calculation. Later I tried to do some calculations to calculate the likelihood of such a “leaf shower,” but it seemed extremely hard. 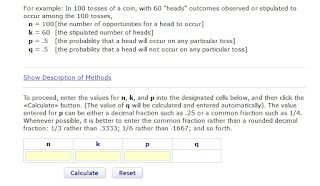 Finally I figured out a technique for making a probability estimate. 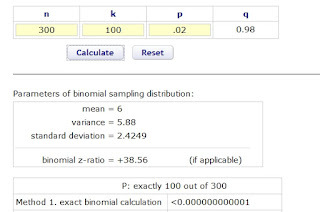 It involved using an online “Binomial probability calculator.” I used the calculator at vassarstats.com for this purpose. Part of its main screen is below. (3) the probability of success on any one trial or try (represented in the screen above as p). But how could I make my observations fit this calculator? I thought of a way. I decided to invent the concept of a “branch minute,” and to use that as the “trial” that the calculator would deal with. By a “branch minute” I meant a particular minute of time during which one particular tree branch might or might not shed a leaf. Under this model a “successful trial” would be a case of a branch shedding a leaf during a particular minute. For the “number of trials” I would put the total number of nearby tree branches within my view while I witnessed this “leaf shower.” Since my walk down this pathway had only lasted one minute, the total number of “branch minutes” would just be equal to the total number of branches near the walkway. I estimated this as 300 (although I easily could have used a number half as much). For the “number of successes” I would simply list the number of leaves I had seen fall, which I estimated as being at least 100. But what about the “probability of success on a single trial”? That fraction would need to be the chance of one branch at this park shedding a leaf during a particular minute on this not-very-windy September day. I used the number of leaves on the walkway to help estimate this number. Given the fact that there were relatively few leaves on the walkway, the fact that it was only September 24 (about a month before peak foliage in New York City), and the fact that the wind speed was low, I estimated the “probability of success on a single trial” as only 2%. This means that if you were to be staring at a particular branch on a tree on this September 24th date, you would have to wait an average of about 50 minutes before you would see a leaf fall from that branch. This 2% estimate seems generous, and the actual likelihood may have been much less. I may note that four days later I walked to the same place, and looked around for three minutes, waiting for a leaf to fall. I saw only one leaf falling. 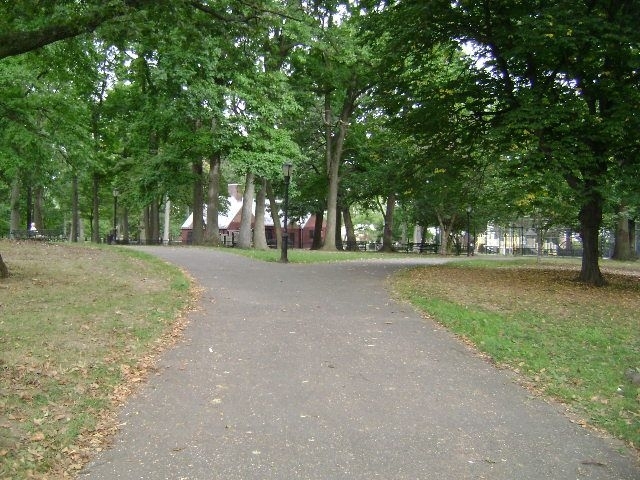 Judging from that observation, and using the same estimate of 300 nearby tree branches, I would have concluded that the probability per “branch minute” of a leaf falling was only about .1% (only a twentieth of 2%), because such a probability would result in only one leaf falling along the walkway every three minutes. So after putting in these inputs, corresponding to the estimates above, I pressed the Calculate button. Here was the result that I got. The calculator indicated that there was less than 1 chance in a trillion that this number of successes (which in this case is the number of leaf falls I saw during that minute) would have occurred. That is a probability less than the chance of you meeting a stranger and correctly guessing on the first try both his social security number and his birthday. The calculation confirms my original thought that what I saw at the park was fantastically improbable. But what if I overestimated the number of leaves that fell, would that make a big difference? It turns out that using this calculator I would have get the same probability (of less than 1 in a trillion) even if the number of successes (the number of observed leaves falling) was only 35. So even if only 35 leaves had fallen during the minute of my walk to the pond, the chance of that happening would only have been less than 1 in a trillion. This shows that the actual probability of getting 100 successes out of 300 trials with a chance of success per trial of .02 (2%) is actually something much, much less than 1 in a trillion – perhaps as low as 1 in a quadrillion or 1 in a quintillion. Why is this possibly significant? Because the odds of this “leaf shower” event occurring naturally seem so incredibly small (much smaller than the chance of you winning 100 million dollars in the lottery tomorrow), there is an almost irresistible temptation to interpret it as a possible sign from the Great Beyond, particularly given the fact that it occurred within an hour after I learned of my sister's death. It's not all that farfetched as it may seem. Imagine that there is some spiritual world that somehow overlaps our physical world. It might be possible for there to be a little energy interaction between the two, of a type that might result in a wildly improbable falling of leaves. I know of one person who saw a rainbow on the day of her mother's burial. She interpreted that as a sure-fire sign from heaven. But seeing a rainbow on a particular day is not terribly improbable. Given the number of rainbows I have seen in my life, I roughly estimate that your chance of seeing a rainbow on the day of a funeral or burial is about 1 in 5000. But the probability reached through my calculation is vastly smaller. Seeing a rare rainbow in the sky is chickenfeed compared to seeing something as improbable as what I saw. Me: It was eerie. On the day my relative died on September 24th, I saw a shower of at least 100 leaves in a single minute, on a day with little wind. Jane: Oh, that's nothing. On the day of my mother's burial, I saw a rainbow. But Jane's comment is wildly off base. The probability of the first event is perhaps billions of times smaller than the second event. So a more appropriate conversation to have is one like the one below. Jane: It was eerie. On the day of my mother's burial, I saw a rainbow. Me: Oh, that's nothing. On the day my sister died on September 24th, I saw a shower of at least 100 leaves in a single minute, on a day with little wind. Some spiritual people say there is no such thing as a coincidence. I don't agree. I think there are plenty of “100 to 1 shot” coincidences and “1000 to 1 shot” coincidences that happen all the time, along with rare “100,000 to 1 shot” coincidences you might see a few times in a lifetime. But when you start considering a coincidence with a probability of much less than 1 in a trillion, that is when it becomes very, very hard to believe that mere coincidence is involved.